”All of them,” John said. When he was told that some already had red sold stickers attached from opening night he looked disappointed but still bought everything that hadn’t been claimed. This apparently was a common approach by John during that period. Several other galleries were cleaned out by his impulsive approach to collecting art. ”Those were the days,” Orchard says. She would rather people were more interested in her current output – most collectors have examples of the old and the new – but she says she finds it encouraging that her early work has such a strong presence on the secondary market. She suspects it’s a way for people to be introduced to her latest creations. One of her 1980s totem poles sold recently through Shapiro Auctioneers in Sydney, fetching $2300 plus 22 per cent buyer’s premium. It was bought by the Bathurst Regional Gallery, whose director is assembling a core collection of Australian ceramics from various decades. This collection puts Orchard’s work in a historical perspective and gives an overview of the artist’s career. Prices for Orchard’s pieces are now on a par with established artists such as Marguerite Mahood and Grace Seccombe. This is good news for those who managed to pick up something in the ’80s, before John walked in and cleaned out the gallery. Early examples of her vases, including her trademark zigzag designs, are now worth between $500 and $1000, depending on size and condition. Her teapots sell for $700 upwards if they are a good shape and colour. One is known to have sold for $1200. It’s worth comparing these results with the value of her current work. She recently sold one of her contemporary teapots for $4000. One reason for the steady interest in Orchard’s work (apart from their visual impact) is that her art has been appreciated from day one. The National Gallery in Canberra and Sydney’s Powerhouse Museum are just two of the leading galleries to hold collections of her work, both old and contemporary. She was also mentioned in Powerhouse curator Grace Cochrane’s 1992 book, The Crafts Movement in Australia: A History, as an example of the revival of interest by young artists in this ancient art form. In Orchard’s case, what was interesting was her use of the slip-casting technique, making moulds from ordinary objects such as sections of PVC pipes, then adding flamboyant colours to bring it to life. At the time, art critics described this as an act of defiance against the old order. Cochrane points out that there are other ceramic artist from this period also worth collecting – notably Patsy Hely and Susan Ostling, although Jenny Orchard is the name most recognisable by the general public. As well as art publications, her work was featured in fashion magazines including Follow Me and Mode and the opening nights of her exhibitions were covered in the social pages. ”Today I’d suppose we’d be Facebook friends,” Orchard says. 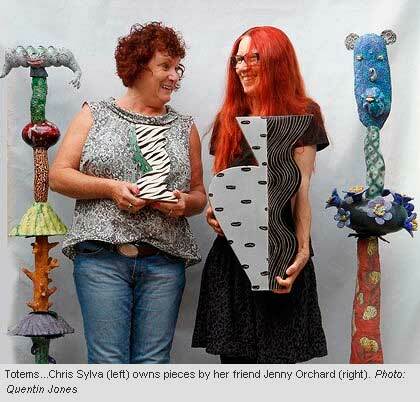 Her zigzag vases were first mentioned in The Sydney Morning Herald in September 1980. These showed the influence of the Memphis style founded in the early ’80s by Italian designer and architect Ettore Sottsass, although in Orchard’s case the design and colours were more directly inspired by the tribal art of Zimbabwe, where she grew up. Her interpretation of traditional South African voodoo dolls is another theme. One of the biggest supporters of Orchard’s work has been Melbourne ceramic specialist Marvin Hurnall, who sold three voodoo dolls from his private collection at a Leonard Joel sale in October 2007. Even he was surprised when one fetched $1200 plus buyer’s premium. He found that the more flamboyant they were, the better they sold. An earlier example, pre-Madonna, sold for a mere $600. Hurnall has since found that there are a number of serious collectors of Orchard’s work, including a well-known media and political figure who would rather remain anonymous. He has been quietly picking up her work for the past few decades and, according to Hurnall, he’s not the only one. And it has always been popular. Her friend Chris Sylva is one of many who have been collecting her work since it first became fashionable in the early 1980s. Pictured are some of Orchard’s celebrated totem poles, a theme she still explores in her contemporary work.